Normally the captain of the hockey team takes part in the ceremonial puck drop before a game. 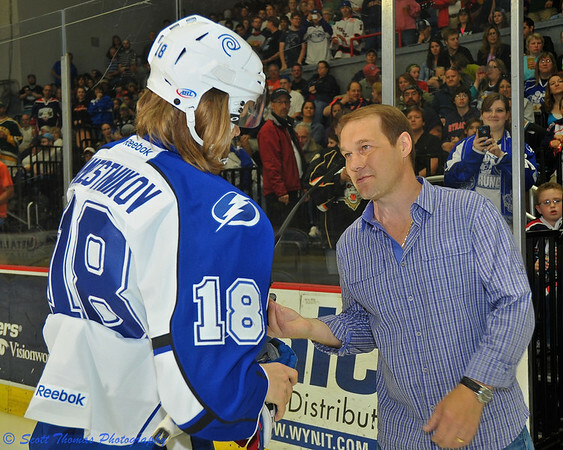 However, when a teammate’s Father traveled all the way from Russia, Syracuse Crunch Captain Mike Angelidis made an exception and let young rookie Vladislav Namestnikov do the honors. 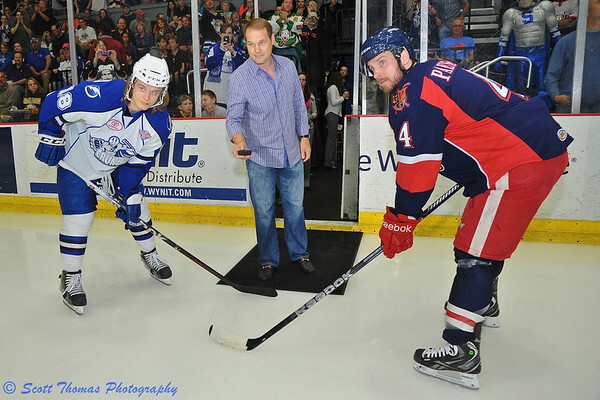 Former Syracuse Crunch player, Evgeny “John” Namestnikov, dropping the puck in between his son, Vladislav Namestnikov (18), and Grand Rapids Griffins Nahtan Paetsh (4) before an American Hockey League (AHL) Calder Cup Finals Playoff game at the Onondaga County War Memorial on Sunday, June 9, 2013. Nikon D700/24-85G, 1/125s, f/5.6, ISO 400, EV 0, 24mm focal length, flash. Back in 1996, Vladdy (as the fans call him) was just a toddler when Evgeny “John” Namestnikov was a player for the Syracuse Crunch. Vladdy does not remember playing in the hallways of the Onondaga County War Memorial where his Father practiced. He does remember a nearby hill by their apartment his Father would take him sledding. Russian players were just starting to come over to North America then as the Russian Hockey Federation allowed their players to go to leagues outside of Russia for the first time. I can imagine it was quite a culture shock for John and his family as well as Syracuse fans. Today, there are many Russian and European players in the American and National Hockey Leagues which has increased the quality of play in both. John retired from hockey back in 2006 after playing for several AHL, NHL and Russian teams. I doubt he thought his son would return to Syracuse to play for the Crunch seventeen years after he did. Made for a great moment in a year full of them for the Crunch to see Vladdy and his Father together on the ice where they both played. Syracuse Crunch Vladislav Namestnikov (18) is greeted by his father, John Namestnikov, who played for the Crunch in 1996, before the Crunch played the Grand Rapids Griffins in an American Hockey League (AHL) Calder Cup Finals Playoff game at the Onondaga County War Memorial on Sunday, June 9, 2013. Nikon D700/24-85G, 1/125s, f/5.6, ISO 400, EV 0, 42mm focal length, flash. Hope all of the Dads had a Happy Father’s Day yesterday. This entry was posted in People, Weekly View and tagged 24-85mm, arena, calder cup, ceremonial, crunch, father, father's day, finals, flash, grand rapids, griffins, hockey, ice, new york, nikon D700, onondaga county, playoffs, puck drop, russia, sb-700, son, speedlight, syracuse, war memorial. Bookmark the permalink. I remember watching John play in the early days of the Crunch. He was surprisingly physical for a Russian player. Kind of wish I wasn’t running late to the game. Would have loved to see this puck drop live.